Typically know the gas or airflow potential of individual wells. A key issue for air storage in a depleted gas field is the mixing of air with residual natural gas in the storage reservoir. 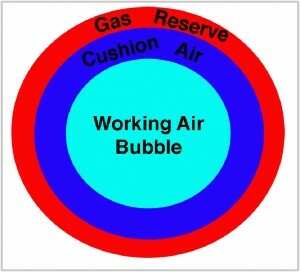 The potential for spontaneous combustion in the depleted gas/air storage reservoir, the combustibility of the air/natural gas mix in the turbine, and detrimental chemical reactions, such as oxygen depletion in the stored air must be resolved before a CAES facility can be commercially developed. Hydrodynamics research on the East Keith depleted gas field in Montana and an abandoned gas storage field in Nebraska demonstrate that CAES is technically feasibile. Our feasibility studies first involed the 3-D numerical simulation of natural gas production from the field to establish reservoir properties and establish a starting point to simulate CAES development in the field. The resulting models were then used to simulate the development of an air bubble in the depleted gas field. Our models simulated the displacement of natural gas to the parameter of the field. The chemical reactions between stored air and the natural gas, the connate water, and the reservoir rock was then modeled. We know how to develop a depleted gas field for CAES that includes well field configuration design, air injection rates and schedules, and air injection and withdrawal operating constrains. Hydrodynamics has completed CAES analysis of three depleted natural gas fields. Hydrodynamics knows the complexities of air storage in a depleted gas field. Hydrodynamics has numerically simulated air storage in two depleted gas reservoirs. Hydrodynamics Associate Dr. John Apps has modeled chemical reaction from air storage in a depleted gas field.